Dumbo flies into the #1 spot on the Weekend Boxoffice Chart, while Marvel's Captain Marvel is closing in on the $1 Billion mark including international box office. Here is the Weekend Boxoffice Chart for the weekend of March 29th to March 31st, 2019. 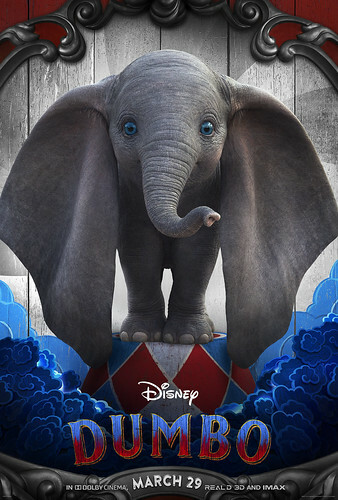 Just saw Dumbo, a little disappointing. Tim Burton needs to go back to Batman, but Michael Keaton as the Joker this time. I saw Alita over the weekend with the wife. Glad I saw it in the theater. Fun film. We both hated the terrible ending, and I wish there was a bit more substance to the whole reason for the war from centuries before, but it was entertaining overall. Worth a watch! How the hell was is a terrible ending? It sets it up perfectly for a sequel. I loved every second of that film. Backstory might be in the manga its based on. I also saw Us today. It wasn't as good as Get Out. He should have tied it to how black folks are their own worst enemies or something, which is where I thought it was going for a while but sadly it wasn't.